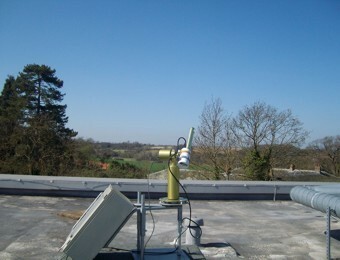 Since 1 April 2012, the University of Hertfordshire is operating an AERONET sun-sky photometer at Bayfordbury Observatory. The instrument provides measurements of aerosol optical thickness (AOT) - an optical parameter that describes the loading of particles in the atmospheric column above a measurement site - during daytime. The instrument performs a combination of direct sun and sky brightness measurements according to the AERONET protocol. The latest data available on the AERONET homepage. The University is also running a lunar photometer for AOT measurements during night. These observations will be integrated into AERONET in the near future. Current efforts at the University of Hertfordshire include the development of a star photometer that will also provide AOT measurements during nighttime. The combination of sun-sky/moon/star photometry enables continuous AOT measurements during day and night. A micro-pulse lidar (MPL) is performing continuous measurements of clouds and aerosols at Bayfordbury Observatory since March 2015. The example measurement below has been performed on 9 July 2015. It shows elevated layers of biomass-burning aerosols from boreal fires in Canada and the development of the planetary boundary layer over Bayfordbury. Boundary layer clouds in the ours before noon attenuate the laser light and inhibit the detection of backscattered light from larger altitudes. Further information about Bayfordbury Observatory, including news and upcoming events, can be found on the observatory homepage.